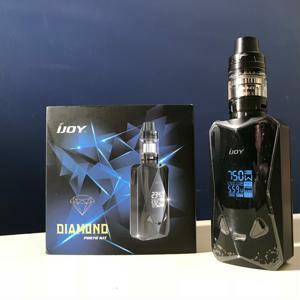 DirectVapor has sent an iJoy Diamond PD270 Kit for review. 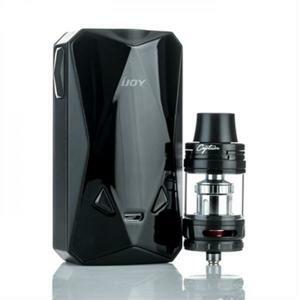 The kit includes the iJoy Diamond PD270 box mod and an iJoy Captain X3S tank. The iJoy Diamond PD270 mod is powered by two 20700 batteries (not included) or two 18650 batteries using the included adapter. You can charge the batteries while they’re in the mod via the micro USB charging port just below the OLED screen. It will operate in variable wattage mode, with a range of 5 -234 watts, and temperature control mode, including TCR adjustments. 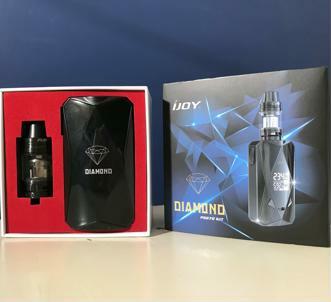 The iJoy Diamond PD270 has a temperature range of 300° – 600° F or 150° – 315° C. The mod will fire Ni200, SS316 and Titanium temperature control coils. Turn the mod on or off with five quick clicks of the fire button. Enter the menu system with three clicks of the fire button. Your options are “P” for power or variable wattage mode. In power mode you can also choose the “intensity setting,” which affects the power output for the first three seconds each time you press the fire button. “Norm” mode maintains a consistent power output. “Hard” mode is 30% higher than your selected wattage setting while “Soft” mode is 20% lower. In “User” mode you can adjust this setting. If choose “T” or temperature control mode your next option is to select the type of coil you’re using or one of the two adjustable TCR settings. The “TCR” option allows you to program two TCR memory settings. The “SET” option allows you to adjust how long the OLED screen will remain illuminated once you’ve stopped pressing the fire button. The final option is “RESET PUFF” which clears your puff counter. The fire button is located on the left side of the iJoy Diamond PD270. The power and temperature adjustment buttons are located below the display on the front of the mod. The iJoy Captain X3S tank has a 4.2 ml capacity. It has a sliding top fill system, simply slide the top of the tank back to reveal the fill port. Adjust airflow by twisting the collar at the base of the tank. iJoy includes two coils with the Captain X3S tank, a 0.4 ohm X3-C1 coil, installed in the tank. This coil has a suggested wattage range of 60 – 90 watts. There’s also a 0.3 ohm X3-C2 coil with a range of 60 – 100 watts. To change coils unscrew the base of the tank and unscrew the old coil. Screw a new into the base of the tank and prime the coil. Then attach the base of the tank to the top and fill the tank. Allow the coil to soak in the ejuice for several minutes to make sure the cotton is saturated before vaping. I left the 0.4 ohm X3-C1 coil in the tank and filled it with the new Stunna Cash Money ejuice from Vape Craft Inc and allowed the coil to soak in the ejuice for a few minutes. I set the power to 80 watts and opened the airflow all the way. As with just about every organic cotton coil I’ve ever used this one had a bit of a cotton taste, but it burned off quite quickly. Vapor production was very good and flavor production was excellent. I backed the power off to 75 watts and didn’t notice much of a difference in vapor or flavor production. Overall I was impressed with the performance, feel and looks of the iJoy Diamond PD270 Kit. I’ll be using the iJoy Diamond PD270 Kit extensively for awhile and will then post a full, in-depth review. Follow Seven Report on Twitter and Facebook to be notified when that review is live. 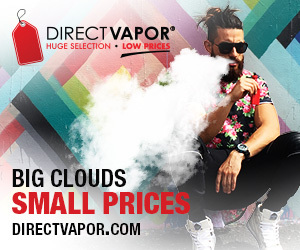 DirectVapor offers the iJoy Diamond PD270 Kit for $59.95 with free shipping. Get more details or order from DirectVapor.